Flow control solutions have long been a specialty of Reliance Water Controls (RWC), who is renowned for leading the way with innovative new products and a range that spans nearly every sector of the plumbing industry. This winter sees the launch of a new and very compact thermal balancing valve (TBV) for use in hot water systems with a secondary return. 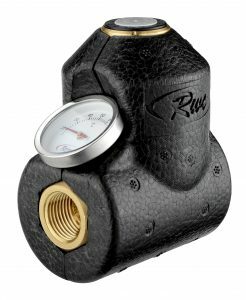 The valve balances the temperature in the system by automatically regulating the flow. The valve will restrict the flow as the temperature rises to its set point, but at 70°C a built-in bypass will open allowing a higher flow rate for disinfection to protect against legionella. Available in ½ in” and ¾” sizes, the compact valve is pre-insulated to save time and cost upon installation. Female connections allow for simple adaptation to a wide range of fittings, while the option of SharkBite push-fit ends enable even faster installation. Features include easy tamperproof set-up, which is easily adjustable between 40 – 65°C, with a clear indicator to show set temperature. A dry-fit, push-in thermometer is also included and eliminates the need to drain the system. The valve comes with a compact and handy insulation case which saves additional insulation time and cost. The body of the TBV is made from DZR brass with high quality internal fittings for durability and longevity. The valve has a maximum working pressure of 10 bar and is accurate to within +/- 2°C. Available spares include a dry-fit push-in thermometer, service kit and spare insulation case. Press release number: RWC/bw 011/15. Issued by Bigginwords.